← Hello. My name is John Sines. Character’s come to life this in a few different ways. First and foremost is their actions and their words – as with any other story. But what is unique to The Unwritten is the size of the letters and the font of the letters for the speech of a character. For example, their is a moment where magic is performed by one of the characters. A spell is cast. The letters for that are: I -M-N-I-C-U-S A-B-S-E-N-T-O. As you can see, this change in font helps to better imagine a type of sound and also aids in developing one’s imagination. It should be noted that the change in font occurs for several reasons throughout the series, this spell only being one of them. The story revolves around Tom Taylor, a man who was made famous by the novels written by his father. The novels are akin to the Harry Potter series, and enlist the authors son as the protagonist (similar to how Christopher Robin of Winnie-the Pooh was based on Christopher Robin Milne). This became a great source of discontent for Tom. When it comes to light that there is no proof of Tom Taylor being his father’s biological son, many (eventually including Tom himself) begin to question if he is in fact the Tommy Taylor of the novels brought to life. From this, the cultural and ideological power of stories is explored. This is primarily set in the present day world. This is elucidated by the language used in dialogue, the buildings of the artwork; and even more noticeably, it is elucidated by the pages devoted to the information age (which you read read about in slightly more detail under the Style section). However, there are occurrences within this story where its characters dive into another story, which will often move the setting to wherever that story was set. For example, in issue 15, one character submerges herself into a Dickens novel, and the artwork and dialogue of those that she encounters resembles that very closely. This is a story that is concerned about the nature and power of stories – not just novel stories, but stories in general. Because of this, the graphic novel explores various mediums to tell it’s tale. There are some pages that have been arranged to look like a computer screen rife with various websites onscreen, typically blogs, televised news feeds, and instant messenger services. Other times, the pages will have one large image accompanied by large blocks of prosaic text – meant to give the feel of a novel. This style helps to accommodate many things, not least of which is the process of immersing the reader into the fantastical world of The Unwritten. Another effect of the style is that it forces the reader to recognize the fluctuations of truth inherent to the process of telling a story. Many of the information age pages (those with blogs, texts, instant messages, news feeds, etc) contribute to one of the essential themes of the work. Where does fact end and fiction begin? What is the full extent of creative power held by an author? Similarly, what is the full extent of the power of the reader? 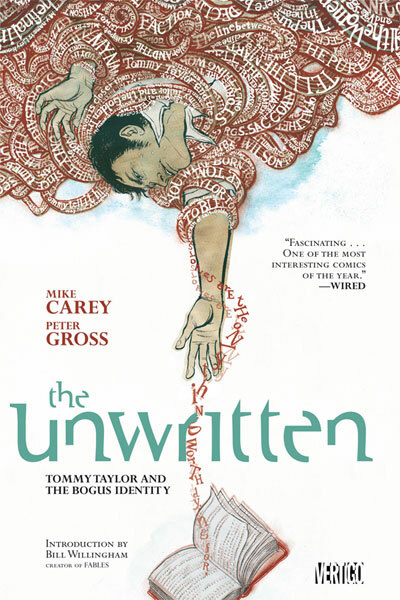 The Unwritten explores these questions by having its main characters actually explore stories. The point of view of this series varies greatly because of its “story about a story” nature. Sometimes third person omnicient, other times third person limited, or sometimes still as a narrative.